It's been three months since Give Big Day, the nationwide day of giving that raised more than $68 million for nonprofits on May 5, 2015. And I contributed to the cause - ten causes, in fact. I gave 10 very modest, but equal, gifts to nonprofits on Give Big Day. Then I watched to see what would happen. The good news? It was a very positive donor experience overall. Most nonprofits did a good job of thanking me, and some did a great job. Let me explain how I selected the nonprofits. Each of the nonprofits serves Bozeman, Montana, where I live. I had a general working knowledge of each of the organizations, but not a working relationship. None of the selected nonprofits were my clients, although I do know staff members at each of the recipient organizations. 9 out of 10 organizations thanked me in some form or fashion. 5 out of 10 sent an email acknowledgement. 6 out of 10 sent a thank you letter via snail-mail. 2 sent me an email acknowledgement AND a written acknowledgement. In 8 out of 9 cases, I was thanked personally (Dear Laura,). 1 form letter included a handwritten P.S. from a staff member. 1 letter was signed by the top ranking staff member and the board chair. 1 letter was signed by every member of the board of directors. The fastest thank you (email) was sent less than 3 hours of making the donation. The slowest thank you (letter) was sent within 10 days of making the donation. And 1 nonprofit still hasn't acknowledged my gift 90 days later. Imagine my surprise (and delight) when I received an email and this picture from the organization's CEO. 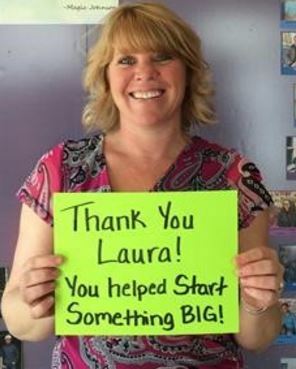 This was the first acknowledgment that I received on Give Big Day, just a few hours after making my donation. This thank you was prompt. And it was personal. What more could a donor want? Well done, friends. I was also impressed with two notes, in particular. The first was from a nonprofit that I've supported before. Although they didn't acknowledge that gift, they did acknowledge my choice and decision to give to them on Give Big Day. "We especially appreciated your gift because of your familiarity with the varied, amazing nonprofits in this town." Another nonprofit made me feel special for several reasons. First, the letter was donor-centric. They talked about me (the donor) and used my name or "you" five times, while only referring to their organization once. Then, they told me how they were using my gift and gave me a specific call to action. "Take a walk along the Story Mill Spur trail and East Griffin Drive in July and see the progress you are helping to achieve!" Lastly, there was an acknowledgement of something unique to me. "Neat feature on Give Big Gallatin Valley in your newsletter!" Do your thank you letters have this level of personalization? Do your donors feel like you truly appreciate their gift? I can tell you that I do. Be sure you're thanking your donors - each and every one - no matter how large or small the gift may be. Do it in a way that is meaningful, memorable and genuine. Focus on the donor as the hero, not your organization. Find ways to make the "thank you" personal. And be prompt. Thank your donors well, and their first gift to your organization could be the first of many. This post was inspired by Bloomerang's $5 Donor Communications Experiment. Want to see how your nonprofit compares? To view their 2014 results, click here. To view their 2015 results, click here. Those of us who work in the nonprofit sector are accustomed to asking people to support our cause. But how often do we take the time to think about it from the donor's perspective? Take time to be a donor, then apply what you learn on #GivingTuesday, Give Big Day...and every day! Get a checklist and learn how to Be Your Donor. So, you want to host a giving day? Download a playbook and start planning for #GivingTuesday (December 1, 2015) or Give Big Day (May 3, 2016). Learn (and use!) the most powerful word in fundraising.